Dustin Bartz wasn’t a particularly avid barbecue fan when he left the South Bay for Texas for his job as a security camera distributor. As he remembers it, “I went to Austin in 2007 and stayed for three years, and that’s where I learned what barbecue was supposed to taste like. When I came back and there weren’t any places to compare with what we had in Texas, I bought a smoker. 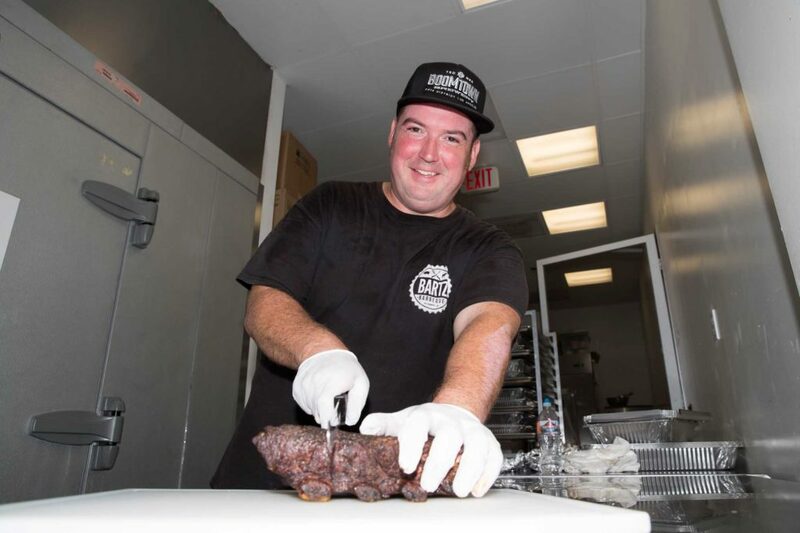 Now barbecue is at the center of Bartz’s world as he travels from brewery to brewery hauling a smoker weighing half a ton, plus wood, hundreds of pounds of meat, tables, and all the paraphernalia of a mobile food stand. Remove mosquito netting that was acting as a sail and put the tent back where it belongs with weights to hold it down. “After hearing people say ‘Hey, you should be selling this’, I spent another year trying to figure out how to do it legally, because I didn’t want to be a fly-by-night operation. I had to learn the health code laws, all of that. I also had to work out transporting everything. I was afraid the truck would be top-heavy and the whole thing would capsize going around a corner,” Bartz said. Menu signs blow away, more bricks added. Though Dustin has the smoker with him, the meat that’s cooking today won’t be served until tomorrow. The meat that will be served today came off the smoker this morning and arrives in an insulated box. This not only doesn’t degrade the result, Dustin says it improves it. Unload food into chafing dishes: bbq beans, mac and cheese, pulled pork, and creamed corn. “The meat has a rub of salt and pepper. That’s it, nothing else. Sometimes I do pork ribs and I’ll add paprika, onion, and garlic, but for my beef, pulled pork, and chicken we keep it simple. You have to sauce pork ribs, and I have sauce for people who feel like they need it, but that’s not the way they do it in central Texas. They sauce it everywhere else I’ve ever been, but not there. “There is a variety of sauces depending on where you are. Some have a thick vinegar base, like Kansas City, or a thin sauce in Virginia and sweeter sauces in the Deep South. But at least they smoke the meat properly before they add it. Here in Los Angeles, most places don’t cook it right. They give it barely any smoke and then pour sauce on it. There are a few around here that do a good job, like that Hop Saint place – it’s a restaurant that serves barbecue rather than a barbecue joint, but that’s about the only place around here where I actually order barbecue. A cashbox is taken out, and now Dustin and Roger are ready to sell barbecue. 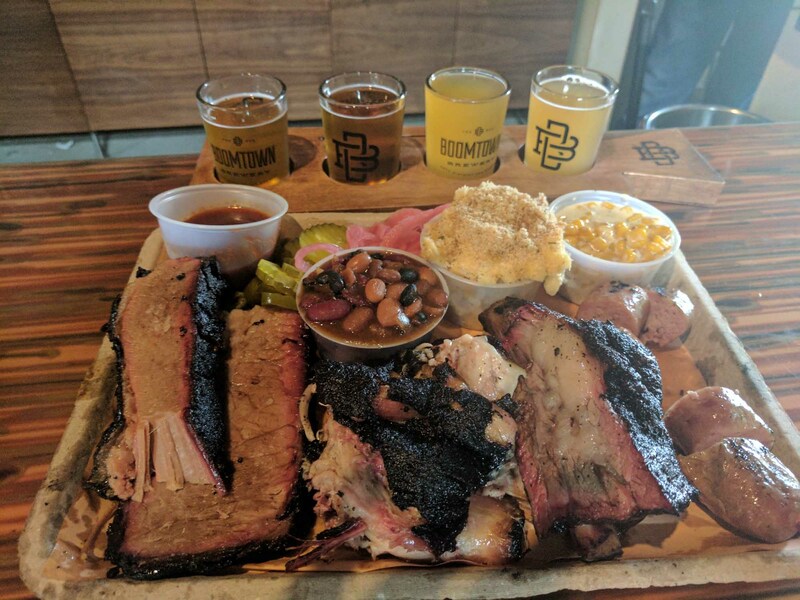 Craft beer and barbecue make the ultimate combination plate. Photo by Brad Jacobsen. My companion and I get a beef rib, pulled pork, and brisket, along with creamed corn, beans, and mac and cheese. Everything is served in Styrofoam containers, and we head into the brewery to get a table and pints of beer. The pulled pork is so tender it practically melts, and the brisket has a crust (called bark by barbecue fanatics) that has the sweetness of caramelized fat. Underneath that is juicy, smoky meat that is incredibly good. Nevertheless, it’s the beef rib that stands out; it’s the best I can remember ever eating. The richness reminds you that this is prime rib meat, the cut prized for both tenderness and flavor even when cooked less adroitly than this. My companion is an amateur barbecue guy himself who has entered competitions. He is in a state of bliss as we share the meal. It took just over 35 minutes from arrival to serving the first plate of ‘que. Then Bartz took the time to greet regulars and chat with the staff at Absolution Brewing. He had a few minutes to rest for before going to Redondo Beach Brewing to do the whole thing again — hopefully minus the part about chasing his tent. You can find where Bartz BBQ will be setting up their stand at bartzbarbecue.com.